Readings are available with Jacquelene near you - One to one readings and readings for audiences at your group or event. You can book Jacquelene to provide your group with readings mobile to you or a venue nearby, ask Jacquelene for more information. The dates and locations of past tours for 2019 are shown below running from most recent event and backwards from there..
Jacquelene appeared, gave for one to one readings, and daily platform reading demonstrations for the audience, as well as a private local group booking. 2nd, 3rd - Wodonga Spiritual & Psychic Expo Jacquelene Close Moore appeared at the Spiritual and Psychic Expo, 2nd and 3rd, and gave one to one readings, and public audience platform readings demonstrations both days, and attended private group bookings locally. 21 24 Brisbane Jacquelene toured Brisbane and provided private bookings for one to one readings, healings, and house clearings, as well as group bookings. 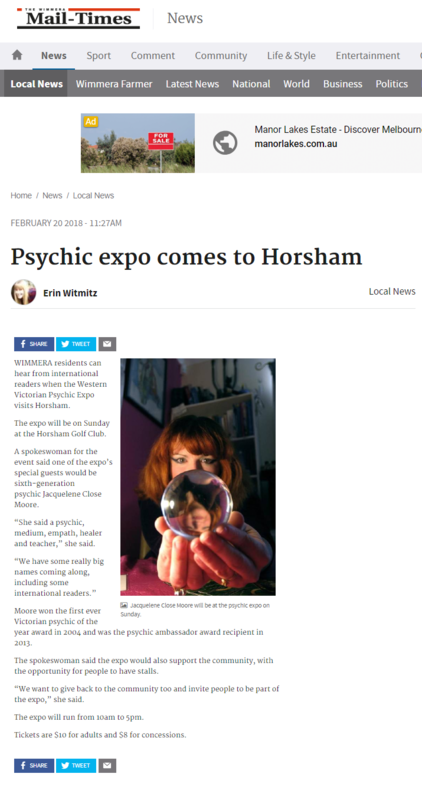 8th - 11th Kyabram - Jacquelene Close Moore appeared at Kyabram Spiritual and Psychic Expo, 9th and 10th, and gave one to one readings, and public audience platform readings demonstrations both days, and attended private group bookings locally on 11th. 4 -7 Portarlington - Jacquelene Close Moore appeared at Body and Soul Holistic Expo, 5th and 6th, and gave one to one readings, and public audience platform readings demonstrations both days, and attended private group bookings locally 4th, 5th and 7th. While Jacquelene's clients comes from over 80 countries across the world, this map and its red dots and lines indicate locations in Australia and the Pacific Islands from which Jacquelene's clients come to consult Jacquelene, or locations Jacquelene has toured, or which is planned or available for Jacquelene's future tours. Group bookings are available by prior arrangement Australia wide and internationally. In 2018 Jacquelene toured events in Melbourne, regional and rural Victoria, and some events in Regional New South Wales and Regnional South Eastern South Australia. The dates and locations for 2018 and previous years will show up running in order from January to December. Jacquelene performed at her appearance at this event with non stop mini readings for the public compliments of Melbourne Central Shopping Centre. Saturday 7th / Sunday 8th Jacquelene Close Moore appearing at Psychic and Wellbeing Expo - Warrnambool, Victoria. For one to one readings and a stage readings demonstration. Sunday 29th Jacquelene Close Moore appearing at Psychic and Wellbeing Expo Bunjil Place - Narre Warren / Fountain Gate, Victoria. ​Saturday 1st Jacquelene appearing at Psychic and Healer's market, Craigieburn, Victoria.. ​Jacquelene will be available for one to one readings​. Saturday 8th Sunday 9th Jacquelene appearing at Spiritual and Psychic Expo Yarrawonga, Victoria.. Jacquelene will be available for one to one readings​. ​Friday 21st - Monday 24th Brisbane, Queensland - Jacquelene was booked for private readings and group bookings in Brisbane CBD. Sunday 30th Jacquelene Close appeared at Psychic and Wellbeing Expo - Epping, Victoria. Saturday 6th Jacquelene appearing at Psychic and Healer's market, Craigieburn, Victoria.. ​Jacquelene will be available for one to one readings​. Sunday 7th Jacquelene Close Moore appearing and giving at Bendigo, Victoria. one to one readings, Public Audience Readings Demonstrations, and Private group bookings. Sunday 25th ​Jacquelene Close appeared at Psychic and Wellbeing Expo - Bunjil Place, Victoria. One to one readings and stage readings demonstration. 19th - 22nd - Jacquelene toured Brisbane, Queensland and provided one to one readings, healings, house clearings, and a workshop. Jacquelene usually appears at up to 30+ events annually, in addition to her fulltime clients, students, mentees, her own weekly psychic show Soul Star Radio, and writing for various print and online magazines. 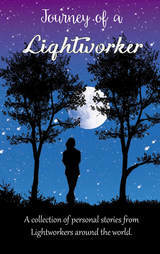 In 2017 Jacquelene only agreed to appear at one public event in January 2017 at Portarlington, and co-authored “Journey of a Lightworker” published in March 2017. In 2018, Jacquelene returns to public events between full time clients, classes, private, corporate functions, and her live weekly worldwide psychic video show. Jacquelene teaches a dedicated year long, ongoing class in addition to her normal full time clients, event appearances, radio, and freelance writing, and editing, as well as continuing on with her own projects. This means that public event appearances are now very carefully selected to fit in around the demands of a high workload. 25- 29th Sydney - Speaking and Platform Readings at Mind Body Spirit Festival. 27th Perth - Private one to one readings.